In North America Shah Rukh Khan may not garner much attention, but in the rest of the world he is top of the movie world. Not only is India the most prolific movie producing nation, they have made inroads in many foreign countries. He can draw a massive crowd in most countries including United States and Canada. I have enjoyed more of his movies to a greater degree than any other actor anywhere. Shah Rukh Khan is above all charming and masculine His acting ability seems mixed, but he has won his share of awards. He has also been in his share of duds and has taken time to make commercially acceptable movies. Having attracted a wide following he gets offered a lot of very good scripts supported by very talented crews. My sister Rebecca liked "Devdas" (2004) so much she bought me a copy. Directed by Sanjay Leela Bhansali and also starring Aishawarya Rai and Madhuri Dixit. A story of a man stopped from marrying his love by his wealthy father. He self-destructs. My sister knows me pretty well and this whetted my appetite. 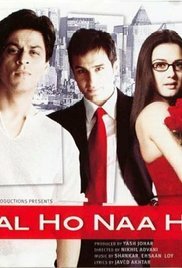 "Kal Ho Na Ho" (2003) is the movie that expanded my fascination with Bollywood to an obsession. Filming was started in Toronto, but the crew left for New York when the SARS scare happened, however you can spot some interesting local scenes. I checked this out of the local library and was told it was "very sad." It certainly was that, but in the beginning it seemed very juvenile like perhaps a stereotypical Bollywood movie. That was just a big setup to make you feel guilty. The main actors and most of the supporting cast were very good; Preity Zinta, Saif Ali Khan and Jaya Bhanali. The music was also great from Shankar Ehsaan Loy. If you really like good movies you will be reaching for a kleenex. After this I looked for movies with Shah Rukh Khan. "Swades" ( 2004) is my favourite. He plays a NRI (Non Resident Indian). He represents the successful Indian gone to the United States space program. He misses his nanny and decides to go back to India in order to bring her to his American home. Once there he encounters a lot of people who are envious and he offers to help them get to the States, however the romance in the story is a local teacher who won't move. Eventually with his science and engineering skill he solves a common problem by providing electric power. He is torn between doing something globally and scientifically significant in the United States or helping elevate the Indian people. Directed and partly written by Ashutosh Gowariker with music by A. R. Rahman. With many third world countries the non resident is a delicate issue with most understanding moving to opportunities while other capable people stick around. Shot in the United States as well as India. This was considered an artistic success, but not commercially. "Khabie Kushi Khabie Gham" (2001) represented a clash with Amitabh Bachchan (who is very good as stern fathers amongst many other types). Kajol plays the chosen one against the father's wishes (who wished for Rani Mukerji). Scenes go from India to England and Wales and include a few shots from the pyramids for effect. Directed and written by Karan Johar as a well produced family drama. "Khabie Alvida Naa Kehna" (2006) is quite the soap opera. Shah Rukh is married to Preity Zinta, but soon wants Rani Mukerji who is married to Abischek Bachchan. A lot of shifting around and lot of anguish, but some really good music by Shankar Ehsaan Loy. Directed and written by Karan Johar. Set in the U.S., filmed in Philadelphia and Jersey City. "Veer Zaara" (2004) with Preity Zinta. This time she is the Pakistani Muslim and he the Indian Hindu in a doomed romance. He is thrown in jail for decades until rescued in time to reunite in old age. Rani Mukerji plays a sharp lawyer that gets him released for a late in life happy ending. Anupam Kher plays the mean prosecutor. Directed by Yash Chopra. In "Chakdei India" (2003) he coaches a girls field hockey team--as a disgraced former international player. His sin was not scoring at a critical point in a championship game against Pakistan. 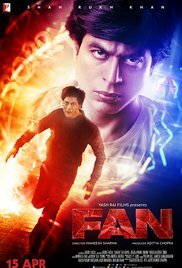 Shah Rukh is a Muslim and many of his roles portray him as one and in this movie he is thought to have betrayed India. No romance, but a typical sports story very well done. Filmed in Australia as well as India. "Om Shanti Om" (2007) launched Deepika Padukone. 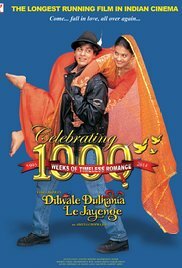 Directed by Farah Khan who had originally been a choreographer very much favoured by Shah Rukh. He plays a dual role, first as a young man who gets involved in Bollywood, but is killed along with a woman he was infatuated with. Thirty years later after re-birth he is again involved in Bollywood and slowly realizes the back story and seeks revenge. Lots of complications. At this point I realize I have gone overboard on one actor, but in fact there is more I want to say, but will defer to another post. Awhile back someone suggested that while the Americans are getting ready for an election, the rest of the world looks at it as an IQ test. In past elections our attitude has been let them fight amongst themselves. Donald Trump has exploded on the scene and is attracting an insane amount of attention and the possibility of him becoming the president of the U.S. is frightening. There is nothing new in this rant, but it is maddening to just sit by while a nearby neighbour is acting crazy. We all know that the craziness potentially affects everyone. I feel lucky to be a Canadian and although I am an older white male, Donald Trump does not speak for me. There is a lot of unhappiness in the U. S. It is very natural to want to blame unhappy conditions on somebody. Too many think it must be the "other". In some cases it is immigrants and in other cases it is dishonest politicians. A few realize that the 1% has disproportionate power and are using it to maintain their spot in the pecking order with little regard to those less fortunate. There probably will always be cycles of prosperity and decline. Sometimes the really bad times can lead to a really violent revolution. We humans take a lot for granted. We feel if things are going up they will always go up and we tend to coast. We would all benefit from a wider perspective. There have been a lot of disappointments over the last decade, but there is a global participation in this sad story. Many other nations endure higher unemployment, wage declines and even greater uncertainty. Physically many parts of the world are suffering from climate change and some overlapping sections are in violent conflict. Comparatively the United States is doing well, but Trump says their economy is a "disaster." Although Obama is not perfect he has helped put the United States in a better direction. He has done this despite an unconscionable obstruction that should be apparent to anyone taking more than a cursory look. It has been the Republicans, largely financed by the 1% who have resisted a stimulus, who deny the merits of the Affordable Care Act, who waste time on social concerns against the interests of the majority. Donald Trump might be a nice reasonable person in private, but he chooses to present himself as a champion of the downtrodden with outrageous solutions to their problems. His tv ratings must have been encouraging and it seems his ego projects those as understanding what needs to be done. The next part of this blog is just recounting some of the many stupidities. They will likely be outdated with other stupidities. Going back to at least 2008 his insinuation that Obama was not legally entitled to be president is very insulting. Nobody else has been asked to prove their citizenship, but Obama has actually delivered proof. Many anti-Obama critics stoutly claim they are not racist, but to us outsiders the whole birther movement seems like proof. Trump may be smart enough to know that many voters really resent a black man in charge. Trump's presentation for the primary season was to call Mexican immigrants murderers and rapists without offering any proof. His solution was to build a gigantic wall and make Mexico pay for it. He knows many unemployed as well as natural bigots feel that these brown skinned people are unfair competition. It is a lot more complicated than that. But underneath it all they are humans, not much different than Americans and they have gotten the short end of the stick. He went on to ban all Muslims from entering the country, admittedly on a temporary basis. Later he said it was just a suggestion. Fear is a great motivator that makes us all overlook justice. America prides itself on its religious freedom, one part of which is that no one has to declare their religion in order to enter the country. Yes, there is something (relatively tiny) to be scared about, but again it is a complicated topic. His attitude towards climate change is ignorance, really selective ignorance. He has a golf course in Scotland petitioning for some construction against climate change. He has recently said that the climate change notion is a strategy of the Chinese to undermine Americans. Campaigning in California he claimed their drought can be fixed in no time when he is in charge. When someone criticizes him he is quick to hit back, usually with an insult. Megyn Kelly, Hilary Clinton, Ted Cruz, David Cameron, Marco Rubio. Typical bully with no substance. To solve difficult problems he would need to work with a lot of people with a different perspective. He is especially hard on women including their looks. It was uncovered not too long ago that he looked forward to the anticipated recession as an opportunity to buy property cheap with no regard for those who suffered from their mortgages being more expensive than their house value. As a president we would want him to lessen or least spread out any unnecessary suffering. As a businessman it is natural to look for opportunities to increase profits, but as president his obligation is to everyone. In the news recently (but been there for over a year) is the legal actions against Trump University. The facts that others have presented indicate that it was fraudulent and took advantage of desperate people. It is very hard to comprehend how he can publicly mock one of the presiding judges as "Mexican" when in fact a natural born American and describe him as a hater. Trump had requested the trial in California be put off until after the election and this judge complied. While Hilary is constantly being challenged by Republicans on phony scandals it would be valuable for the American voters to learn the truth about Trump University. A recent twist was that a PGA tournament was pulled from one of his Florida golf courses to of all places Mexico. We have been assured that this was not political. Perhaps not directly, but organizers have admitted it was because they couldn't line up a sponsor. Lots of businesses now realize a connection to Trump might prove toxic. Trump managed to insult the move. It seems no matter how long or devastating the list becomes there are still a lot of people who would vote for Mr. Trump. My hope is that enough American voters are roused to stop this potential disaster before we all suffer. It is not unacceptable that one person can present himself as Trump has, but it is frightening that large numbers of people would support him. I have faith that there are many intelligent, responsible Americans, but I will feel more comfortable if they can pass this IQ test. How about you?